Yesterday I was able to catch the WinHEC keynote where Bill announced the trifecta of Betas (Vista Client, Server and Office 2007) and most importantly to see the keynote demo of XPS. It went off without a hitch, although it is so nerve-racking to watch a marketing guy who knows very little about our technology give a demo. We watch with apprehension, but finally, elation once it was over. 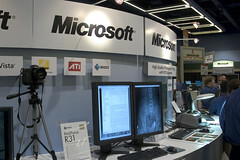 Great exposure for XPS. The buzz around XPS, Color and our Web Services for Devices work was outstanding. Lots of people seeing our demos, asking questions and lots of our partners showing off their demos built on our <?xml:namespace prefix = st1 ns = "urn:schemas-microsoft-com:office:smarttags" />Vista technology. Lots of fun, just walking around the booths and hearing people talk about the technology we are building. One of the amazing things we showed which probably will fly under the radar of the top-line press, is a demo of high-dynamic range, wide-gamut photo printing using the new imaging pipeline in Windows Vista. 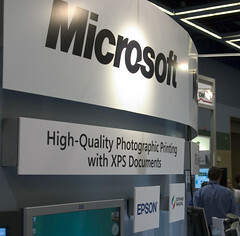 We showed a demo of printing from the Vista photo gallery a wide-gamut photograph stored in Windows Media Photo format to an XPS-enabled wide-gamut Epson photo printer. The output was great, you could really see the difference in the side-by-side comparison. The printer was being driven by a print driver put together for us by Software Imaging. For the consumer, the photo printer is able to deliver high quality prints using a wide color gamut without having to circumvent bottlenecks in the OS. With these advances in Windows Vista and with new XPS-capable wide gamut printers, this capability exists right out of the box. Between Windows Media Photo, the new Windows Color System and XPS, a new level of color quality and fidelity is now achievable. We also had some color demos showing driving >8bpc out to some HDR monitors – stunning results. Lots of articles out there about Beta 2 shipping, most make some mention of XPS. If you are a gluten for punishment, you car read the minute by minute run-downs of the WinHEC Keynote. The videos are also up on Microsoft.com. 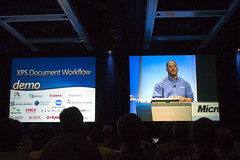 Will’s keynote with the XPS demo is here (XPS demo starts at the 10-minute mark). I’m not familiar with this company, but buried in their press release on their latest financials is a comment about support XPS! Well, we are trying to support XPS, too, but it ain’t really easy and straightforward to create XPS documents. Some samples for ‘real life’ XPS document creation would be great! Most stuff I’ve seen so far is so very basic it does not help at all.